(Natural News) Once upon a time during the Clinton presidency, there was concern shortly after the Democrat-led Congress passed and Bill Clinton signed an “assault weapons” ban, that POTUS was preparing mass gun confiscation and round-ups of all Americans thought capable of opposing the tyranny. What also began circulating around that time — the early-to-mid 1990s — were rumors that the Clinton administration was building prison camps that would be run by the Federal Emergency Management Agency. Conspiracies abounded regarding these “FEMA camps,” many of them widely denounced by the Left as absurd creations of the Far Right. My, what a difference 25 years and a polarizing political environment make. In recent weeks, the Left has become more and more unhinged over the Trump administration’s continuation of an Obama-era policy and law where children are separated from criminal border-jumping adults as a means of discouraging parents intent on breaking our immigration laws from bringing kids on a dangerous journey through Mexico. Even former Republican National Committee chairman Michael Steele has joined the absurdity. During an appearance on little-watched MSNBC last week Steele actually used the concentration camp comparison. Seriously, Michael Steele? For one, it’s hot in Texas; would you rather these kids died from heat exhaustion? Also, does it bother you that the “concentration camp” comparison is not only wholly inappropriate but demeaning of the horror inflicted by real Nazis running real concentration camps in the 1940s? Steele wasn’t the only one to make the comparison, it should be said. On Sunday, former NSA and CIA Director, retired Air Force Gen. Michael Hayden, tweeted a picture of a concentration camp at Birkenau, which was then a part of Nazi Germany, but is now Poland. “Other governments have separated mothers and children,” he wrote to accompany the picture. Besides being inflammatory, it’s wholly inaccurate — and misleading. Lo and behold, a Democratic and Trump-hating CNN admitted that the same things were happening during the Obama administration, but the president and his minions sought to cover it all up (with most of the media’s help). 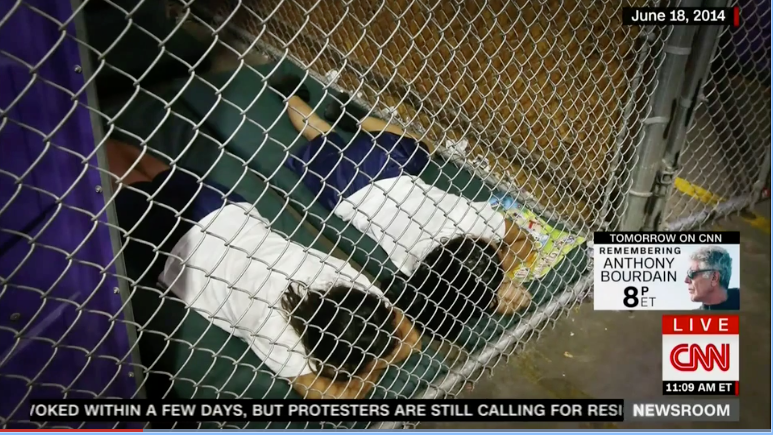 As reported by The Daily Caller, Rep. Henry Cuellar, D-Texas, told CNN’s Fredricka Whitfield on Saturday that Lord Obama worked to cover up the child migrant crisis. “It was kept very quiet under the Obama Administration. There were large numbers of people coming in. The Obama administration was trying to keep this quiet,” he said. He also dropped a couple more truth bombs. In other words, they’re gaming our system. Those who are using this migrant crisis to divide the country and score political points are not helping to solve the problem but are only driving Americans further apart. Read more about the migrant disaster at InvasionUSA.news.